This June photo of former NFL quarterback Donovan McNabb was provided by police in Gilbert, Arizona. Donovan McNabb, the NFL quarterback turned commentator, will be sidelined from his jobs at Fox Sports and NBC Sports in the wake of his arrest in Arizona late last month. Fox Sports said Sunday evening that McNabb had been "suspended indefinitely." "It is important that Donovan use this time as best he can to resolve his personal situation," the network said. NBC previously said he was taking a leave of absence from his radio role there. 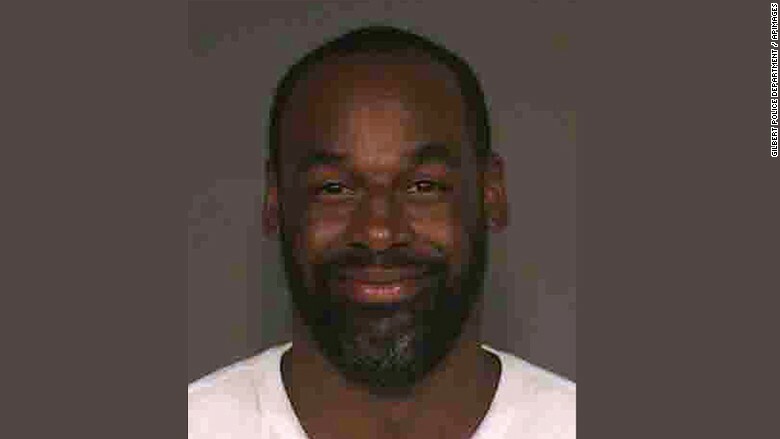 McNabb was arrested on June 28 when police officers in Gilbert, Arizona, suspected he was driving under the influence of alcohol, "the second such arrest for the former NFL quarterback in the last 18 months," the Arizona Republic reported last week. McNabb rear-ended a car and later showed several signs of impairment, according to police documents. He has not been found guilty in the case. But he did plead guilty in March 2014 to a DUI violation, and spent one day in jail for it. If found guilty this time, he faces a steeper sentence. McNabb was the celebrated starting quarterback for the Philadelphia Eagles between 1999 and 2009. He briefly played for the Washington Redskins and Minnesota Vikings before retiring and entering the media business, first as an analyst for NFL Network, then for Fox Sports. He appears most often on "Fox Sports Live," the cable channel's flagship program. He also co-hosts "Under Center with McNabb & Malone" on the radio network run by NBC Sports. According to NBC's Pro Football Talk site, McNabb made reference to his arrest on the show last Tuesday -- saying "I am very aware of it, handling the matter at this particular point" -- but did not go into details. The next day, NBC said he was off the show for the time being. "Donovan McNabb is taking immediate leave to address some personal issues, and we support him in this decision," the radio network said. Sunday's decision by Fox to suspend McNabb was first reported by Sports Illustrated.